GKN Aerospace has been living up to its motto of “making things fly” in South Carolina since 2011. The British-based company’s journey began with the announcement that it would invest $38 million in a new assembly plant in the state. Since completion, the GKN site in Orangeburg, South Carolina, has assembled aerospace components for various companies, including fuselages for Honda jets and floor grids for Boeing. second state-of-the-art facility adjacent to the original assembly plant. The new 126,000-square-foot facility will produce inlet lip skins for the Boeing 737 MAX and 777X. 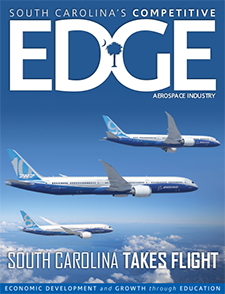 Bill Beard, who recently retired as vice president and general manager of GKN South Carolina, talked with EDGE about how readySC and Orangeburg-Calhoun Technical College (OCtech) provide key components of the company’s success. EDGE: What would you like to highlight about the services that readySC and OCtech have provided for GKN? Bill Beard: We go through a pre-hire and a post-hire training process that’s facilitated by readySC and OCtech. All of our assembly technicians, which is the predominance of our workforce, are trained through a combination of readySC and OCtech. It has been a great partnership for us. We’ve gotten great assistance from readySC in locating, screening and selecting candidates for going through the training. readySC provides the instructors who are very skilled and knowledgeable, and do a great job. They also help us in many ways to determine which of those candidates will be best suited for different types of work. EDGE: Do you have any specific examples of how readySC’s training has contributed to your employees’ long-term success? BB: Since we’ve opened the doors here, we’ve had a philosophy of promoting from within. We have examples of team members who have gone through that training, gone through that selection process, and started as assembly technicians to later advance through to quality inspectors. In three cases, they’ve become supervisors and in another case, a gentleman has gone through that process and is now in a quality engineer role. EDGE: What do you consider the top positive outcome of readySC’s recruitment and training program? BB: That’s an easy one. It is that we are able to bring in team members who are ready to go to work on the first day. They’ll go through an internal training process as well, but we’ve got team members that are able to walk through the door, are safe, knowledgeable, and ready to go to work on Day One. EDGE: If you had to come up with one word or phrase that would describe readySC, what would that be? EDGE: If given the opportunity to recommend readySC to another company, what would you say? BB: I would say that the state provides us a great resource that enables us to recruit, select, train, hire, and onboard team members in a fairly rapid process. I would recommend that anyone should use readySC. EDGE: Is there anything else you’d like to add about OCtech, specifically? BB: OCtech has also been a great partner for us. They dedicate classroom space. They work with readySC on the instructors, and they also provide instructors for some of the administrative-type pieces of work that are in that training curricula. 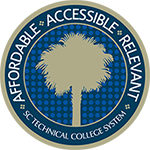 Again, I can’t say enough about both readySC and OCtech and the quality of people that we’ve gotten through their training program. GKN Aerospace is one of the world’s largest independent first-tier suppliers to the global aviation industry. With over 100 years of aerospace experience, the company supplies high-value, integrated assemblies in metallic and composite materials for both military and civilian aviation markets. 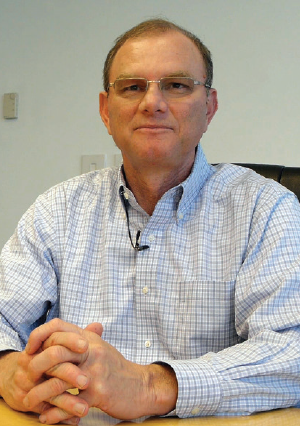 It employs approximately 17,000 people in more than 62 locations across three continents.